I’m not going anywhere today. Campus is closed. Bus service has been suspended. There’s a nice fellow outside clearing my sidewalks and driveway—I don’t own a snowblower, and it seemed like madness to clean up after this blizzard on my own when I can hire someone to do it for me while I sew reindeer and sip hot beverages (enjoying snow days the way that they are meant to be enjoyed). So I set out to make this peppermint mocha, a favorite of mine but something that I never order because it costs almost as much as having this guy clear my driveway. I’ve never actually had the Starbucks version, but I can say that the one at Barriques is quite delicious and generally comes with a tiny candy cane hanging off the side of the mug. Last year, I became obsessed with Trader Joe’s peppermint hot chocolate. I don’t remember why, but I bought a little bottle of peppermint extract at some point to attempt turning all things into all things peppermint, so I find myself trapped in my house today with all the necessary ingredients. I think that this recipe is okay. I scaled the whole thing back to make a smaller mug than the massive serving size it was intended to produce (1/4 cup of sugar in just one mug? 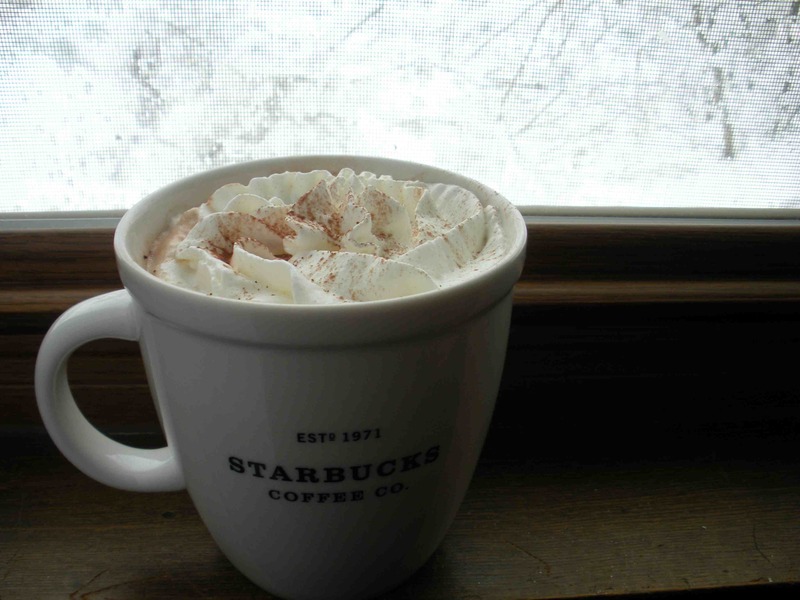 no thanks)–about 1 T. of cocoa and a couple of spoonfuls of the peppermint syrup. I found that there’s no reason to boil the syrup for 20 minutes—it started to turn into candy-cane material. I’m not even convinced that the syrup step is necessary at all—why not just add sugar and peppermint extract to the water and cocoa, and then add that to the milk and espresso? I ended up adding a few more drops of extract to my drink at the end to get the flavor without the extra sugar. I think that I’ll keep tweaking this, but it’s kind of a fun snowy-day activity (and treat). ah! 1/4 cup of sugar!!?!?? i keep a little bottle of agave nectar around for stuff like this–it’s like pre-made simple syrup but with less of a sugar high (and it’s not artificial, and it doesn’t taste slightly wonky like stevia). it is the miracle sweetener! and i’ll bet it would make a totally awesome mocha. ooh, I have some agave. That sounds like a good idea.